Changes in weather and climate can affect human health. According to the National Aeronautics and Space Administration (NASA), the difference between weather and climate is a measure of time. Weather is what conditions of the atmosphere are over a short period of time, and climate is how the atmosphere "behaves" over relatively long periods of time. An easy way to remember the difference is that climate is what you expect, like a very hot summer, and weather is what you get, like a hot day with pop-up thunderstorms. From 2010 - 2015, there were 176 heat related deaths in Missouri. From 1998 - 2015, Sixteen children died of heatstroke in a vehicle in Missouri. Flooding killed 27 people in Missouri in 2015. A warming climate will bring changes that can affect our water supplies, agriculture, power and transportation systems, the natural environment, and even our own health and safety. Experts from the Centers for Disease Control (CDC) and the United States Environmental Protection Agency (EPA) predict that changes in the climate will bring more intense and prolonged heat waves and other extreme weather events, as well as a rise in sea levels. According to the EPA, many places have seen changes in rainfall, resulting in more floods, droughts, or intense rain, as well as more frequent and severe heat waves. These changes have the potential to affect human health in direct and indirect ways, imposing economic and public health burdens on society. On average, extreme heat causes more deaths each year than hurricanes, lightning, tornadoes, floods, and earthquakes combined. Heat also increases ground-level ozone concentrations, causing direct lung injury and increasing the severity of respiratory diseases such as asthma and chronic obstructive pulmonary disease. People who are most vulnerable to extreme heat can protect themselves by staying in air conditioned or cooler locations during heat waves, limiting strenuous activity, and staying hydrated. 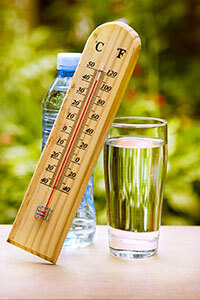 Learn more about hyperthermia in the Sunny with a Chance of Heat Stroke brochure and flier. When exposed to cold temperatures, your body begins to lose heat faster than it can be produced. Prolonged exposure to cold weather will eventually deplete your body's stored energy, resulting in hypothermia. Low body temperature may make you unable to think clearly or move well. Learn more about hypothermia in the Frigid with a Change of Frostbite brochure and flier. Take proper precautions during cold weather spells to prevent carbon monoxide poisonings. Increases in both extreme precipitation and total precipitation have contributed to increases in severe flooding events in certain regions of the United States. 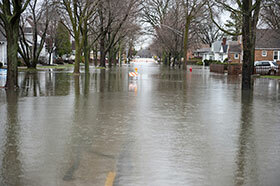 Floods are the second deadliest of all weather-related hazards in the United States. Learn about how to prepare your home on short notice if evacuation due to flooding becomes necessary in the Checklists for Evacuation Preparations Encouraged Ahead of Possible Flooding. Mosquitoes take advantage of severe weather events, some types benefiting from floods, other types actually increasing during drought. Longer periods of warm weather directly relate to a longer tick host-seeking season. Mosquitoes and ticks can spread diseases (like West Nile virus and Rocky Mountain spotted fever), some of which can lead to hospitalization or death. Mosquitoes and Ticks Can Spread Disease, learn how to prevent mosquito and tick bites using insect repellent. Inclement weather, such as thunderstorms, high humidity, or freezing temperatures often contributes to an increase in asthma symptoms. Increased rainfall and flooding often result in increased mold and mildew, which are also considered asthma triggers. Warmer wet weather equates to longer growing seasons which naturally increases pollen and allergens. The state’s air quality is directly impacted by Missouri’s wildfires and the large field burns that often occur in Kansas and Oklahoma. For more information, contact the Department of Health and Senior Service's Bureau of Environmental Epidemiology, at (573) 751-6102.